Baker Memorial Library of Dartmouth College, the tower of which is a copy of Independence Hall in Philadelphia. 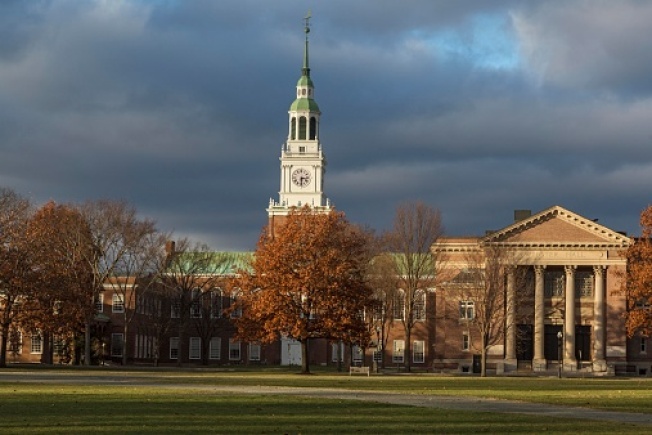 Dartmouth College attorneys have presented new evidence to prevent a fraternity embroiled in an alcohol-related hazing scandal from retaining its residential status. The Valley News reports Dartmouth cut ties with Sigma Alpha Epsilon last winter, and the fraternity is now fighting a ruling that their de-recognition also means that their College Street home can no longer serve as a residence. Hanover's zoning ordinance requires that residences in its "institutional district" operate in conjunction with an institution. But fraternity officials argue they shouldn't be subject to the requirement because the house predates the ordinance's adoption. Dartmouth lawyers presented records showing that the college's trustees had worked with the fraternity before 1976.